All eyes were on Gregg Berhalter’s first games in charge of the United States Men’s National Team against Panama and Costa Rica, but few gazes were more concentrated than that of the new head coach himself. The new boss lived the action from the touchline, chatting to the players on the bench as the game went on, no doubt elaborating on the various roles they had been playing in training, and where they could affect the game themselves — describing how the work they had been doing in their January training camp transfers to a competitive environment. These were a promising couple of games against nations who, regardless of their perceived strength here, had qualified for the 2018 World Cup at the USMNT’s expense. Though it’s too early to get carried away, the signs were encouraging. The meeting with Panama set the tone for what was to come against Costa Rica, and it appeared that the January camp had been used to get these players on board with the style, and make sure each knew the roles they might have to play if selected. 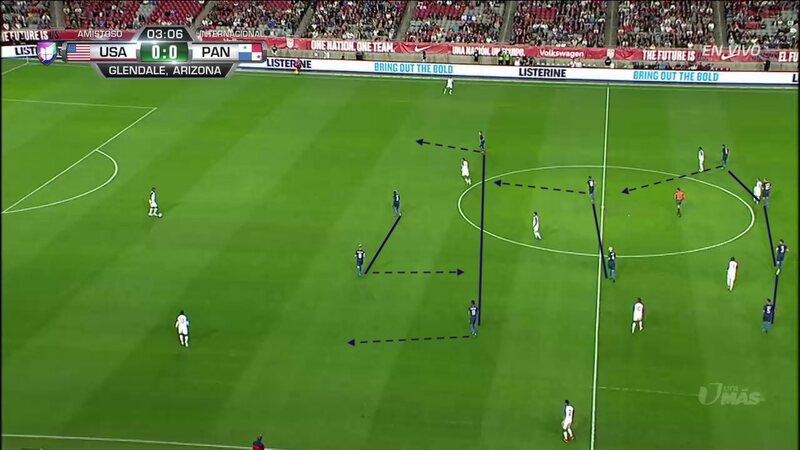 At times the defensive shape appeared more attacking than the formation the team fell into when in possession. The two wingers pressed the opponents high when required and the most attacking of the three midfielders — Djordje Mihailovic — pushed forward to join Gyasi Zardes in the front line of defense. 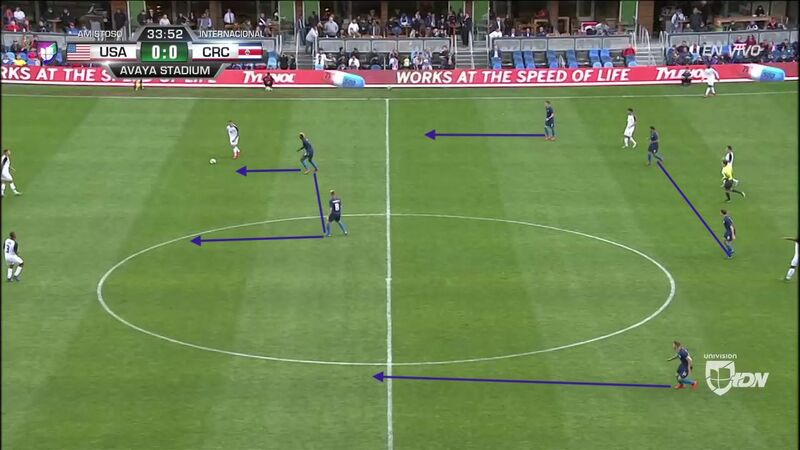 This created a formation which resembled a 4-2-4, not dissimilar from the 4-2-2-2/4-4-2 Berhalter used at Columbus Crew. The USMNT formation vs Panama in Gregg Berhalter’s first game in charge. Transition from defence to attack is indicated by arrows. But in attack another midfielder was added to the mix in the shape of right back Nick Lima. 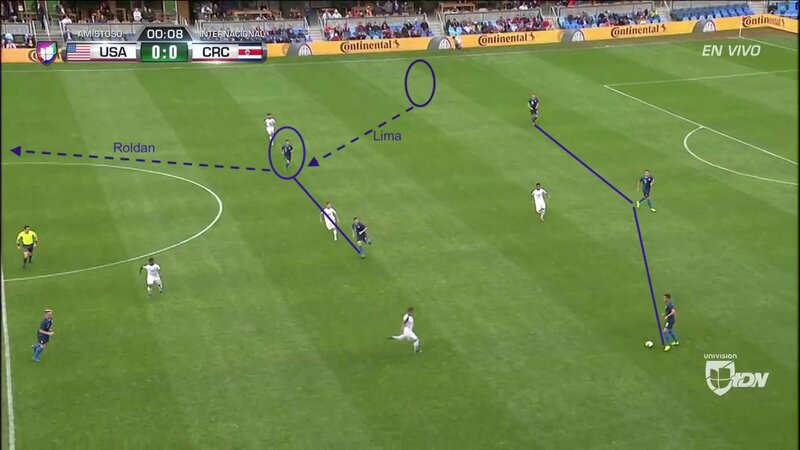 Very occasionally Lima would overlap down the right, but more often than not he joined Michael Bradley in midfield, which then allowed Cristian Roldan to push up from his starting point in the midfield three creating something like a 3-2-5 with the ball. Lima’s use in two positions meant he did a lot of running between right-back and midfield, and could even be found on the edge of the opposition box in attack. However, he wasn’t that involved in the game in terms of actions, and finished the game the fewest of any of the US players who played the full 90(+4), and also fewer than the quietly impressive Bradley who played 86 minutes. It was his movement and positioning which caused problems for the opposition, who weren’t sure who to mark when he drifted into midfield. One of he or Bradley would hold their position while the other joined the attack, while the runs of those ahead of them unsettled the defense. Berhalter has spoken previously that his main aim tactically is to “disorganise the opposition”, and using Lima in this manner was effective in doing so. Though Lima’s role drew the tactical headlines, if such things exist, the roles of Mihailovic and Roldan — forced in part by Lima’s movement — were perhaps more telling in this game. Mihailovic may have been wearing 8, but for the most part he was a 10 or even support striker, as demonstrated by his first-half goal. Roldan, wearing 10, was more like a no. 8, moving between Bradley and the attack, and pushed forward by Lima who took the Seattle midfielder’s defensive spot as the US played into the opposition half. This team played without regard to numbers, and under Berhalter references to the 8, the 10, the 6, etc. may become impractical when trying to describe what these players are actually doing on the pitch. Manchester City’s Kevin De Bruyne has spoken of the “free eight” role which is used by his manager, Pep Guardiola, and that may be a more accurate description of Roldan’s assignment against Panama and Costa Rica. Berhalter’s use of players in this fashion is encouraging for a number of those looking to break into the USMNT. In certain games there might be room for two players considered modern no. 10s, while in others the box-to-box midfielders may be favoured. The US now have plenty to chose from in both areas. 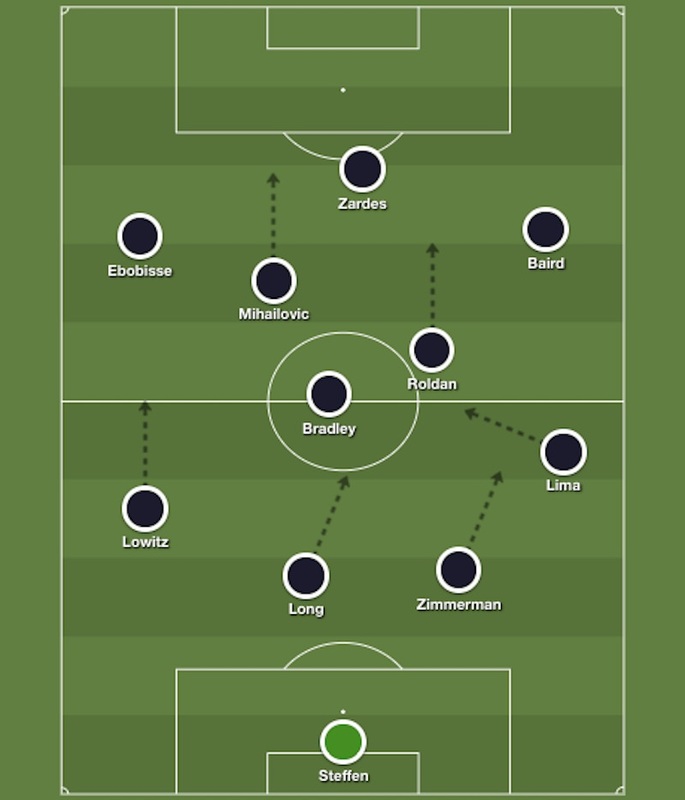 Versatility will be key, so when you have players like Weston McKennie playing all over the field for Schalke, Tyler Adams looking like the best box-to-box midfielder in the Bundesliga during his first two games for Leipzig, and creators both deep and attacking coming through the ranks, Berhalter’s tactics could be ideal for the next generation of USMNT stars. Against Costa Rica it was more of the same. Lima cutting inside in this right-sided box-to-box role pushed the team on. The wingers were again important to the press as shown below. You get the impression from Berhalter that he will go with at least one workmanlike winger who gets his tactics, as opposed to highlight reel dribblers or speedsters — though the latter will still have their place. Some players, such as a certain Christian Pulisic, may even be able to offer a combination of tactical nous and highlight reel play, but it was Corey Baird of Real Salt Lake who was tasked with that role here. The United States welcome South American opponents in the next international break, and Berhalter’s new-look USA side will be tested further against Ecuador and Chile. It won’t necessarily be the case that the new coach sticks with the tactics we saw in these games, but the basic principles will remain the same. There will still be echoes of that 4-2-2-2 / 4-2-4 in defence, but in attack he will look at the style of the opposition before deciding whether to throw a tactical curveball. 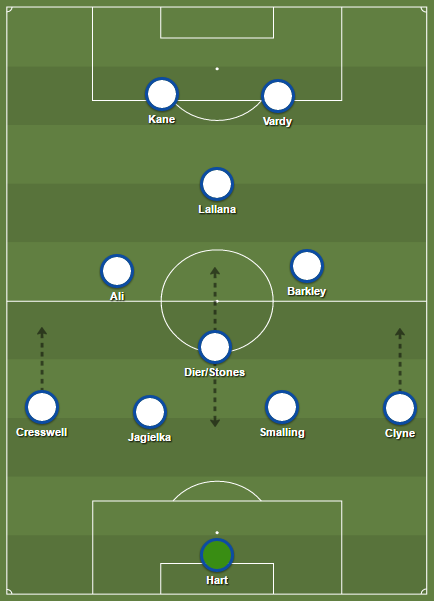 Regardless, it’s good to have this one in the bag, safe in the knowledge that these players can carry out these instructions if required, and towards the end of these games they also used a formation which at times looked more like a standard 4-2-3-1. The composition of the squad is also likely to change for the March fixtures. The roster for these games was made up of North America based players only, but next month players based in Europe will also enter the mix. There are likely to be a number of new names and debutants, as there were here, as Berhalter begins the tough task of instilling a style of play in the limited time an international head coach gets to spend with his players. Luckily, a lot of those coming from Europe will already be familiar with pressing and possession play, so it should just be a case of fine tuning. This type of setup looks like the best chance the USA have of success. It doesn’t underestimate the players’ ability to carry out tactical instruction, and plays to the strengths of many of the emerging stars in the USMNT pool. But even if the Berhalter era is not successful, it will at least be interesting. Very good report and please keep them coming.